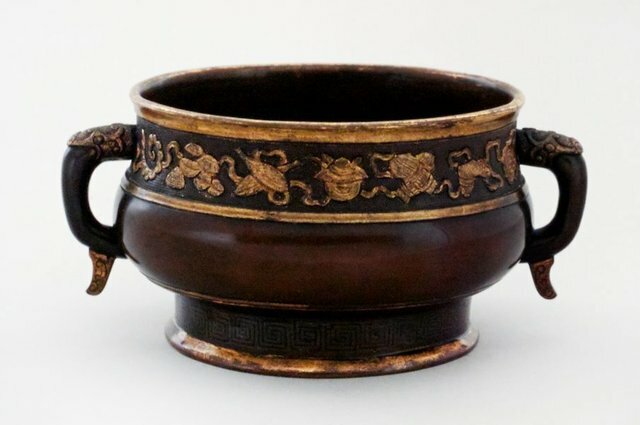 The Ming esteem for early bronzes led to the production of contemporary copies for use on household altars as well as for secular use. Hu catered to this market, specialising in wares for the Chinese scholar, specifically those for the incense cult. His family studio was active in the late Ming in the key cultural area known as Jiangnan to the southwest of Shanghai in Jiangsu province, a famous centre for metalcraft. Wares such as this censer represent the fascinating co-operation between the elite scholars, who evolved a distinctive aesthetic, and the artist craftspeople they commissioned to articulate this aesthetic. Out of his co-operation came some outstanding works of art, particularly in metalwork, much of which, like this censer, was archaistic in flavour. Signed base [six-character artist seal: made by Hu Wenming of Yunjian - Songjiang, Jiangsu (Yunjian Hu Wenming zhi)] Not dated.